Tonights episode features a part of a seven hour set from Alice D Joanna recorded at 24 h Summer Special @ Planet Waldfrieden. Tune in at 2000 CEST to a fresh progressive pleasures @ our progressive channel. In 2004 the back to back dj-team Alice D Joanna was born and grew up succesfully with different main floor bookings straight away. They present a double​-conce​ntrated dose of female DJ power that frequently sends the crowds to blissful euphoria. In Berlin there even is a series of club nights at KitKatClub exclusively dedicated to the two of them, where they keep up their frisky vibes for each full 14 hours. They both hold residency at waldfrieden and are a crusial part of most of the events happening there. Tonight it's time for our next progressive pleasures. This month it's a home game because after one year of absence mitschi himself will present you some of his current favorites. Thank god it's progressive. & friday. A new h-milch session is on the way. To you lovely listeners. Today 20h CET. Prog-House channel. djbaq with fresh tunes in the mix. Tune Inn. Our next progressive treat is on the way. Tonight we bring you a new mix by Mikadho. Tune in at 2000 CET to a fresh progressive pleasures @ our progressive channel. Mikadho started his career as a drummer in several Punk-Bands in 1991. At the same time he started listening to Techno and electronic music. In 1993 he explored his first trance party and was deeply touched by the warm feeling and the peaceful mood of the psychedelic people. Since 1995 he wanted to participate in the scene and started his career as a DJ. In the beginning Mikadho preferred classical Psychedelic Trance, but then switched to more UK and Progressive Trance. Later on he started to promote his own party called Suncircle and became resident dj at Waldfrieden and Atisha in germany. Beeing a label dj for Spintwist, Cosmicleaf and Y.S.E. 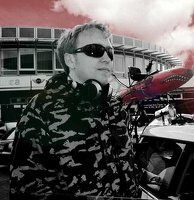 , Mikadho became a well established part of the trance scene around the globe. Nowadays he is working as event manager from behind the scenes, but is still playing as a dj around the world. You can find him in the usual places like facebook, soundcloud and mixcloud.